When you think about an energy-efficient building, you may picture a newly constructed building that meets or exceeds LEED® standards and features many energy-saving bells and whistles. However, there is a great opportunity to save energy by rehabilitating an existing building instead of constructing a new building. In fact, the real savings—in energy and dollars—lie with existing roofs in the U.S., which encompass 50 billion square feet, according to the Center for Environmental Innovation in Roofing. The Department of Energy (DOE) and other policymaking organizations have established efficiency targets for buildings with the ultimate objective of net-zero energy and emissions. As a result, the American Society of Heating, Refrigerating and Air-Conditioning Engineers (ASHRAE) Inc. is developing standard 90.1-2010, “Energy Standard for Buildings Except Low-Rise Residential Buildings,” with the intention that when a typical newly constructed commercial building is designed to comply with the standard, it will consume 30 percent less energy than buildings complying with ASHRAE 90.1-2004. According to the National Renewable Energy Laboratory, a typical commercial building would consume more than 70,000 British thermal units (Btu) per square foot (floor area) per year under ASHRAE 90.1-2004, in which case a potential 21,000 Btu per square foot per year reduction could be achieved with an ASHRAE 90.1-2010-compliant building. This new standard will provide substantial progress toward these reduction targets when promptly adopted and effectively enforced. However, the proposed standard language does not adequately address energy-efficient improvements to existing buildings. According to the Energy Information Administration (EIA), about 82 billion square feet of commercial building stock floor space consumes nearly 90,000 Btu per square foot per year. If measures are not taken to upgrade these structures, roughly 3 1/2 Quads (1 Quad equals 1,015 Btu) of energy will be consumed as a result of inefficient existing buildings. Installing high R-value roof systems when performing roof system replacements is one of the most practical and economically feasible opportunities to improve existing buildings’ energy efficiency. Pittsburgh-based Bayer MaterialScience LLC’s April 2009 study, “Energy and Environmental Impact Reduction Opportunities for Existing Buildings with Low-Slope Roofs,” examines the energy, environmental and financial benefits of installing additional insulation on low-slope roofs. The study provides an analysis of these benefits based on climate and building type, as well as an estimate of aggregate national results. The scope for the Bayer MaterialScience study included all existing buildings in the U.S. with low-slope roof systems that need to be replaced or whose owners upgrade their facilities by installing solar equipment. A detailed analysis described in the report uses available market data sources to estimate the typical annual square footage opportunity for low-slope roof system replacement. Following is a summary of the study’s research methodology. The study’s core objective was to establish a comprehensive, reliable evaluation of the improvements achieved by installing an energy-efficient roof system. It was clear that to satisfy this objective we needed to use a state-of-the-art energy modeling tool that performs a whole-building energy analysis. We selected EnergyPlus, a software program developed and maintained by DOE. EnergyPlus is a simulation tool that can model all energy and water use in buildings. DOE sponsors the tool’s continual improvement and testing and releases an improved version twice per year. Version 3-1 was used for the study. Figure1: Thirteen locations in ASHRAE Climate Zones 2-6 were included in the study. The Bayer MaterialScience study included 10 of the 16 reference models within EnergyPlus—retail, strip mall, warehouse, small office, medium office, restaurant, supermarket, primary school, secondary school and small hotel. 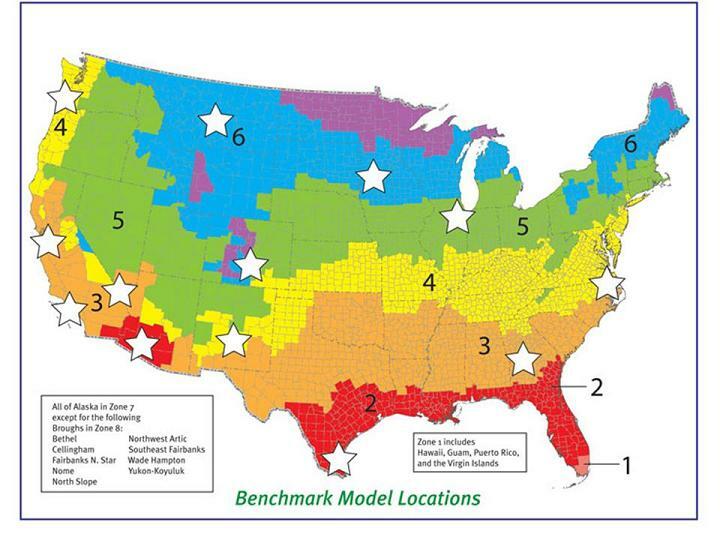 In addition, 13 of the 16 DOE prototype locations—representing ASHRAE Climate Zones 2 through 6, as well as moist, dry and marine locations—were included in the analysis (see Figure 1). The report indicates more than 97 percent of total floor area in existing buildings is located in ASHRAE Climate Zones 2 through 6. At the time the study was conducted—during the first quarter of 2009—all the DOE models were typical of newly constructed buildings that meet criteria established in ASHRAE 90.1-2004. For this analysis, the input models representing all existing buildings assumed to be 20 to 50 years old included insulation entirely above the deck with an R-value of 12.4. The input models for the energy-efficient replacement roof systems used an overall roof insulation R-value of 25.4 for Climate Zones 2 and 3 and 30.5 for Climate Zones 4, 5 and 6. This assumes the existing R-12.4 insulation is reused and 2.2- or 3-inch-thick polyisocyanurate insulation is installed on top of it. The resulting two-layer insulation values of R-25.4 and R-30.5 satisfy the minimum prescriptive requirements of ASHRAE 90.1-2010′s preliminary version for these respective climate zones. • Installing low-slope, energy-efficient roof systems provides a vital opportunity for many building owners to save significant money on heating and cooling costs while conserving a vast amount of the U.S.’ energy and water resources and limiting environmental effects such as greenhouse gas emissions and smog. Furthermore, insulation is a readily available, long-proven technology. • The savings and other benefits are substantial enough to anticipate that energy-efficient roof systems could be installed on an estimated annual 1.5 billion square feet of commercial floor area undergoing roof system replacement. The study weighted the market share of each building type used in the study. For this exercise, the latest EIA Commercial Building Energy Consumption Survey (CBEC-2003) data were used. The consumed utilities of electricity and natural gas, as well as the additional installed insulation required for an energy-efficient roof system, were evaluated from a cradle-to-grave perspective. As a result, the complete life cycle energy—known as source energy—and resulting potential global warming emissions, were quantified and compared. The economic analyses used established resources for the basis of all calculations. Utility cost calculations were performed by the EnergyPlus program; flat annual inflation rates on electricity and natural gas were based on EIA projections; and current installed insulation costs were taken from the RS Means CostWorks Online Construction Estimator. The Bayer MaterialScience study findings demonstrate substantial energy, carbon footprint and utilities cost reductions are achievable with energy-efficient roof system replacement. Carbon footprint is calculated by determining a product’s greenhouse gas emissions throughout its entire life cycle from the production of the raw material used during its manufacture through the product’s use to its final disposal. 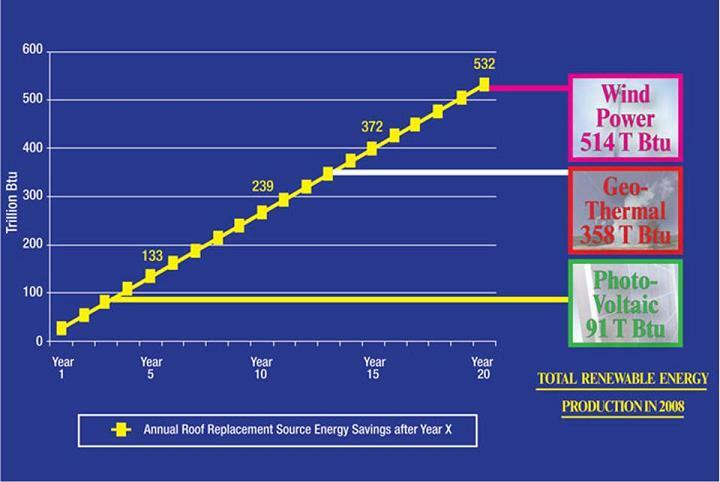 By improving thermal performance during reroofing, building owners should save $2.4 billion in utility costs and 0.266 Quads in source energy and prevent more than 19 million tons of carbon dioxide-equivalent emissions annually after a 10-year period. From a life cycle perspective, the energy saved by adding insulation during roof system replacement on the 10 building types studied was 20 to 28 times greater than the one-time energy use required for extracting and processing raw materials, as well as manufacturing, installing and transporting the insulation. These calculations were based on a conservative 30-year product life. 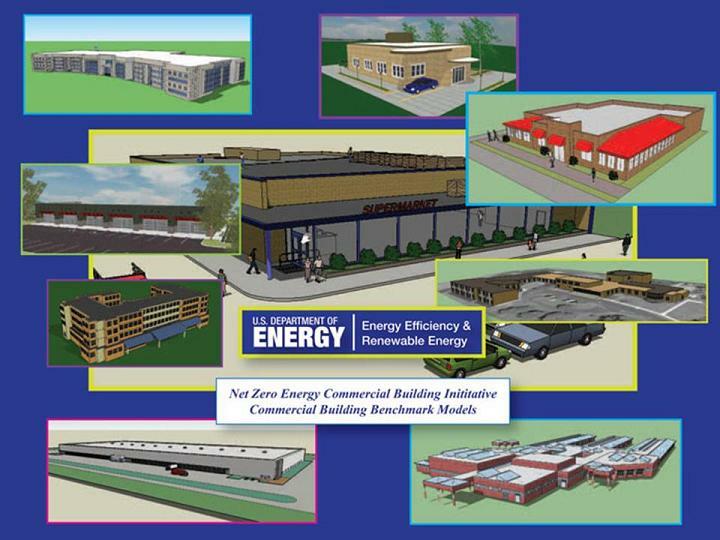 According to Buildings Energy Data Book, existing commercial buildings consume about 18 percent of all U.S. annual energy based on floor area. Because a majority of these buildings will require roof system replacement during the next 15 to 25 years, there is a practical opportunity to improve their thermal performances when the time for roof system replacement comes. As such, these buildings play an important role in the challenge to achieve substantial reductions in energy consumption and environmental effects. In light of economic conditions, opportunities to save money currently may be lost because of the tendency to eliminate—or at least delay—capital projects and instead patch roofs. This opens the door to costly roof system failures later, as well as missed opportunities to increase buildings’ energy efficiency immediately and in coming years. Realizing energy-efficiency opportunities and taking action can lead to rewards in the future. Maintaining, repairing, replacing, or restoring commercial roofing systems are one of the largest expenditures for building owners. Don’t miss a practical opportunity. Consult a Minnesota Commercial Roofing Contractor about how to increase the energy efficiency of your building right now and in each year that follows. This entry was posted in Commercial Roofing Contractor, Flat Roof MN, Minneapolis Commercial Roofing, Minnesota Commercial Roofing Contractor and tagged commercial flat roof system, commercial flat roofing, commercial roofing mn, commercial roofing system, energy efficiency, flat roof mn, High R roof, High R value roof, low slope roofing, low-slope roofing system, Minnesota commercial roofing contractor, roof replacement. Bookmark the permalink.